Oracle introduced a new cool concept called “Application Containers” in 12cR2 (12.2.0.1.0). I have already written about this topic in the article “Introduction to Application Containers in Oracle Database 12cR2”, where you can find an introduction to the topic and see a couple of examples. Since version 8.0, Oracle Database has had the partitioning feature, which helps you access data faster. Since 8.0 there have been several enhancements for partitioning, types of partitions, objects that supports partitioning, etc. In Oracle Database version 12.1.0.2 Oracle introduced the “CONTAINERS” clause, a very useful clause that can be used to execute queries across several Pluggable Databases. What if we use Pluggable Databases as partitions? What if the PDB name is used instead of the CON_ID? Thanks to this insight, “Container Maps” was introduced in Oracle 12.2.0.1.0. Unfortunately, at present, “Container Maps” are not available to use with normal Pluggable Databases. “Container Maps” can be used only with Application Containers (Application Root + Application PDBs). The illustration below shows how “Container Maps” works. In it, you see an end user executing a query and filtering the data by country=’GUATEMALA’. Internally, Oracle uses Application PDBs as partitions, where each Application PDB represents the data of a specific region (North, Central, South). 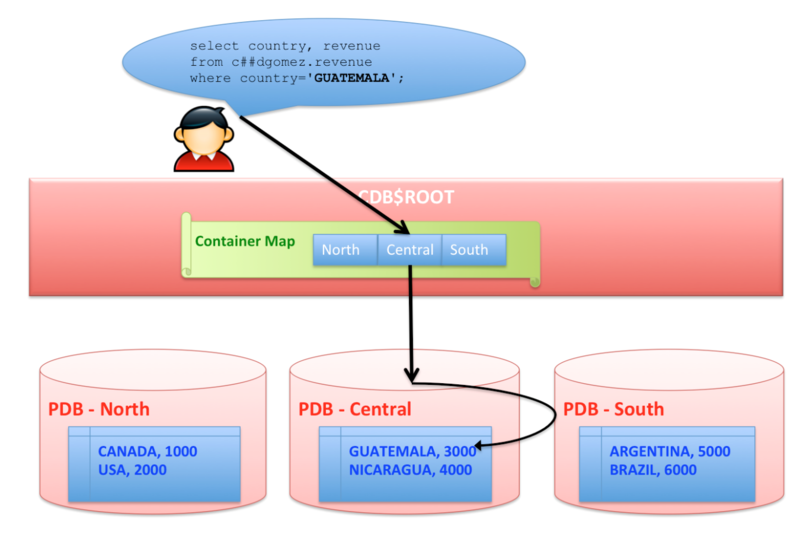 After determining in which “partition” (Application PDB) all the files with the country=’GUATEMALA’ are located , Oracle then proceeds to query the table which is stored in that specific “Application PDB” –in this case, the Application PDB named “CENTRAL”. Of course, the table can also be partitioned as always, using all the enhancements in Oracle partitioning up to version 12.2.0.1.0. In the following example we will explain step-by-step how to use “Container Maps”. First, I will create an “Application Container”, an Application Root named “Nuvola”, and three “Application PDBs” named “NORTH”, “CENTRAL” and “SOUTH”. If you want to read more about Application Containers you can read my article Introduction to Application Containers in Oracle Database 12cR2. A container map is a simple table that has the information on which “partitions” (Application PDBs) are used and which column is used to address the data; in this case the column “country”. The type of partitioning used here is “BY LIST”. Note that the name of the “partitions” matches exactly with the name of the “Application PDBs”. Now we will create an application and we will insert some data. This is just to show a couple of SELECT examples, so that you can see how the data is gotten transparently through the “partitions” (Application PDBs) based on the column “country”. It is not mandatory to use “SHARING=METADATA”. I am using this because all I want to share among the Application PDBs is the metadata (the objects, without data). The data will be physically stored into each Application PDB. Now, time for the magic. I will connect to the “Application Root” and from it I will execute two queries. You can see that the SELECT statements don’t have any filter with the column CON_ID nor the Application PDB name. We are just getting data from a simple table (C##DGOMEZ.REVENUE), but the SELECT statement understands that Container Map is enabled, it will ask in which “partition” (Application PDB) the value “GUATEMALA” is stored and then it will query the table “C##DGOMEZ.REVENUE” in that specific Application PDB. We saw in this article a new, cool concept that combines the CONTAINERS clause, partitioning, and Application Containers. DBAs and developers will be able to take advantage of Container Maps, particularly s for reports that have to get data across several Application PDBs, without having to rewrite the code, and without having to add new clauses in the SELECT statement, taking advantage of Application PDBs as if they were partitions.